I’ve heard vague rumors of the existence of a new game console out there, which means it’s time for accessory makers to cash in. 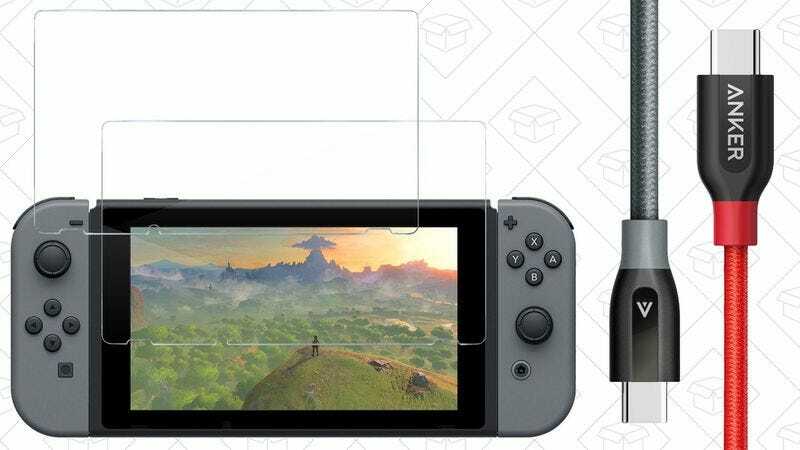 Check out the links and promo codes below for Anker PowerLine+ USB-C cables to keep your Switch charged, plus a screen protector to keep it pristine. Through some quirk in licensing deals, Mega Bloks beat out Lego for the rights to create Star Trek toys, and the crown jewel of them all has never been cheaper. The U.S.S. Enterprise construction set is currently marked down to an all-time low $100, and a $20 clippable coupon brings that down to $80. I’d set your course for Amazon and engage warp factor 7, because this is unlikely to last. You can take your gaming to the next level with a pair of popular mice marked down to all-time low prices on Amazon. The Logitech G302 features six programmable buttons and on-the-fly DPI switching up to 4000 DPI, which is a solid feature set for just $25. For $50 though, you can step up to the Corsair Scimitar RGB, which packs in a 12,000 DPI sensor, dynamic backlighting, and a 12-button side panel for MMOs which you can actually slide up and down the mouse for maximum comfort. Amazon’s Alexa is basically the operating system of the home, but to fully appreciate it, you need to scatter Echoes and Echo Dots around your house until they can basically hear your from anywhere. If you’re ready to fully commit, Amazon’s offering a solid discount on the already-affordable Echo Dot when you buy three, this week only. Even at full price, the 8GB Fire HD 6 is already one of the best sub-$100 tablets you can buy. At $35 though, it’s a ridiculously good steal. The big caveat here is that it’s a certified refurbished unit, but this deal is half the current price of buying it new, and an all-time low by $15. It’s also $15 cheaper than the entry-level Fire tablet, which has a worse (albeit slightly larger) screen, a slower processor, and less battery life. There’s no such thing as owning too many Lightning cables, and that’s especially true when you can get two for $10 with promo code OFVYEPBB. OxyLED’s OxySense motion-sensing closet light is one of the best-selling products in Kinja Deals history, and it’s easy to see why. You can stick it anywhere, it turns itself on and off, and it’s super cheap. Today, add two to your cart, and get both for $15 with promo code 2POXYT02. Stock up on all the footwear you could need to get outside for spring from Amazon’s one-day Merrell shoe sale. Take up to 40 percent off shoes for many different occasions, like hiking, running, or trekking from one of the most popular outdoor brands. You’ll probably need to think of more excuses to leave work and get the heck outside.